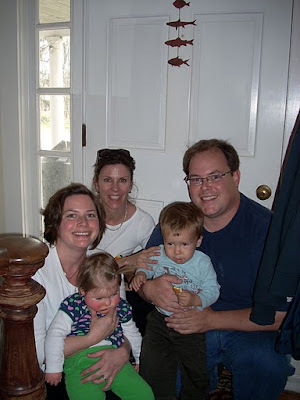 October and November have been very rocky months in our household with regard to seizures. Beginning October 1st, we had not had more than 4 or 5 days in a row seizure-free. We had a 4-day hospital stay a few weeks ago and another last weekend. In between, there was an ambulance ride and visit to the local hospital because she had a cluster at daycare. Peppered throughout that was a lot of at-home seizure control and administration of Diastat to break clusters. Greg and I have been alternating and working from home whenever possible to watch her. We are on our 6th medication now. Trileptal, Keppra, Clonopin, Zonegran, and now Dilantin and Lamictal. It's difficult to remain hopeful that we will find a way to control these seizures when despite our best efforts, they have become more frequent. We are currently building up a new drug in her system called Lamictal. It's crutial that Lamictal be built up very slowly in the body, over 2 months or so. We were told that Lamictal is a really good drug. There are few side effects, but there is one and its a bad one - a rash to look out for that is very rare, but can be fatal. So we are visually scouring Meredith day and night for any signs of rash, since we're told that if you are going to get it, it's likely that it will present within the first few weeks. So far, so good - no rash : ) We will use Dilantin as a bridge drug until we get the Lamictal up to speed. Dilantin seems to work better than anything else we've tried. She had a seizure on Monday of this week, but no cluster. Just one random, short seizure - this is very rare for Meredith. Usually, if she has one, we can be sure she'll have many more. Dilantin is an an older drug with undesirable side effects if used long term (think; hair), so the doctors do not recommend using it for any length of time. 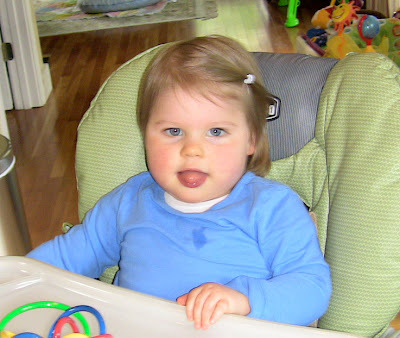 But so far, she's had fewest seizures while on this drug, so we are very happy for that. And since she should only be on it for a few months, the yucky side effects shouldn't come into play. Monday we have an appointment at Children's Hospital to discuss the Ketogenic diet. They have a Keto Clinic there where we will meet with a nutritionist to discuss this diet as a future possibility. If you are interested in reading a neat article on this diet or have never heard of it, click here. It has helped many children who's seizures fall into the "difficult to manage" category and is really interesting. Science does not know why exactly it works. I am a big believer in the link between nutrition and health and we feel that if we are still nowhere in a few months trying to control these seizures with meds, we will most likely give this a shot. Our other big news is that we have decided to accept the invitation from Children's Hospital for Meredith to be part of a medical study on Microcephaly. Meredith, Greg and I will each give a blood sample, then the study begins. The study has been going on for 8 years and could continue for another 10. They will only contact us if they come across new concrete findings. The study includes families from across the globe with specific interest placed upon families in the developing world. Since many of these families are larger, including many more children than a "typical" US family, the familial gene pools are greater, providing more scientific data to observe. Hopefully our contribution to the study will one day provide more information for children like Meredith. I have absolutely no idea how they managed to get 8 babies to look at the camera at the same time - amazing! They came up with a clever solution for Meredith's "park scene" - she's sitting in a dressed up Bumbo. Greg spoke with Dr. Fayad yesterday via phone where it was decided that the best course of action is to switch Meredith's medication to Keppra. Keppra is a similar medicine that also has few side effects, though the one most often noted is an increase in irritability. Hopefully Meredith will not experience this, but if she does, supposedly a dose of vitamin B6 helps combat the issue. So we spend this week tapering off Trileptal and onto Keppra. So far it has gone smoothly and she's taking to it well. Trileptal is really good for some kinds of seizures (the kind that showed up on her EEG), but can actually make other kinds worse. We wonder if the trileptal was making things worse for her since she never had clusters of that many seizures pre-trileptal. Cross your fingers for better results with Keppra! We had another long weekend, but all is good now. On Thursday, Meredith's seizures didn't stop so when I got home from work, we decided to go to the hospital. Greg and I are getting good at this routine and knew to go straight to Children's and bypass Milford Hospital. We checked into the ER and Meredith was hooked up for monitoring. They tried several medications with no success to get the seizures to stop. They continued until 7am the next day resulting in a total count of 35 seizures. She would seize every time she woke up and then pretty much pass right out again. It was taking such a toll on her little body, you could see how depleted she was. Finally, something they gave her worked and she did stop. The last one she had was 7am Friday morning and she has been seizure-free since. 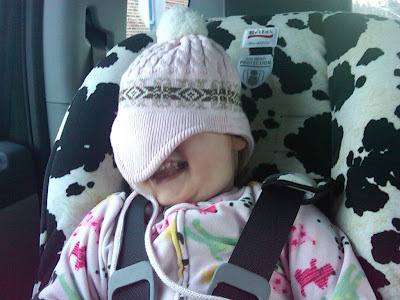 Once they stopped, she was happy and smiling almost immediately, almost manic and hyper. She was awake all day and took no naps. Greg stayed with her that night at the hospital since I had done the night before (they only let one parent stay) and he said she was awake ALL night. Doing her little yelps and laughs all through the night. What is she laughing at!? He slept snug as a bug on a windowsill hospital bed (joke) and also logged in zero hours of sleep. The next day, she continued to not nap and also continued to not seize - we were thrilled. They told us we could take her home and we were out of the hospital around 3pm. She is on her regular Trileptal and they are supplementing with another anti-seizure med called Keppra. So right now she is on two. We go see the Neurologist soon to discuss the best treatment going forward, but for the time being, she will remain on the two. Today, Meredith is back at daycare and I think she was happy to see her buddies again. They are playing "Minute To Win It" this week. They give each child a magazine and whoever can rip out the most pages in one minute wins! I think Meredith got smoked by Maisie, but I'm sure she put up a good fight : ) So cute, I love KinderCare. I talked with them about our weekend and they were supportive as usual. I couldn't dream up a better daycare scenario, I absolutely love this organization. So our count begins again and we are on day 4 with no seizures. It's been a couple weeks since I've posted here, which for us is actually a good thing as there is not too much to report! Meredith has not had any seizures in 19 days, which is awesome, awesome, awesome. She seems to be doing well on her new dose - so far, so good. I took a much needed week off work in early May and just stayed home. It actually felt like a nice long break. We enjoyed all the sunny weather, spent lots of time outside and planted our vegetable garden. Hopefully in a month or two, we'll have some yummy snap peas, cucumber, cantaloupe, lettuce, basil and tomatoes right from our own garden. And blueberries too. We are still working on getting Meredith's stander but are trying to iron out a little insurance wrinkle before we can move forward. We also applied for MassHealth, CommonHealth for Meredith which is supplemental insurance for children with disabilities. 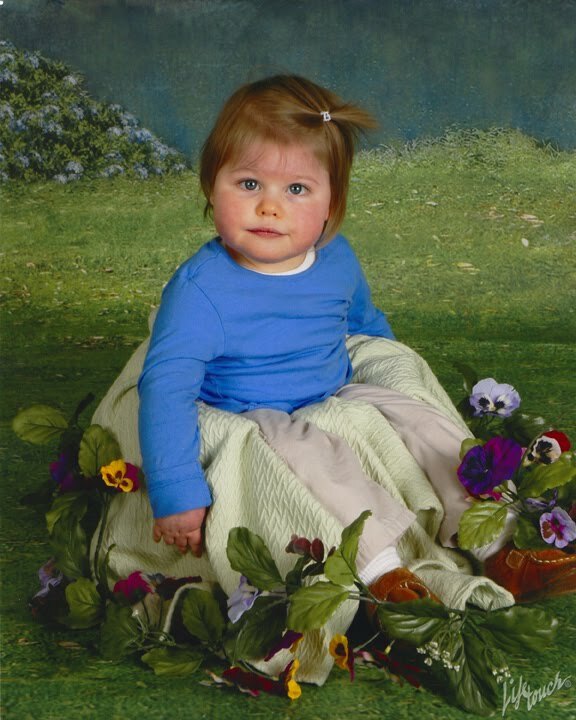 It takes about a month to hear if she got approved for coverage or not, so cross your fingers for us - they would cover things like the stander : ) Yesterday, Meredith had picture day at school and they said she did great. And today is class photo day. I'll post one here when I get them so you can see! Trying out my new stander! Last weekend was one we had been looking forward to for quite some time because Uncle John was in town from San Francisco! It was so nice to have him home. We had lots of fun hanging out and we got to meet John's girlfriend Jackie and her son Graham. We quickly fell in love with them both and made sure the kids got in lots of quality time. Graham is absolutely adorable and I can't wait to see him again. His interest in feet and Meredith's interest in hands helped them hit it off right away : ) There was beautiful weather all weekend and after a brunch at our place on Easter Sunday, we went to the park and played with the kids for a while until it was time to send John, Jackie and Graham off... A great weekend. This week we also made progress on the stander front. We were able to get our hands on a loaner stander which we will leave at daycare and we will still move forward with purchasing one that we can use at home. This way we won't need to transport it back and forth. Grandpa was nice enough to swing by the Early Intervention office on Monday and pick up the loaner and deliver it to our house. 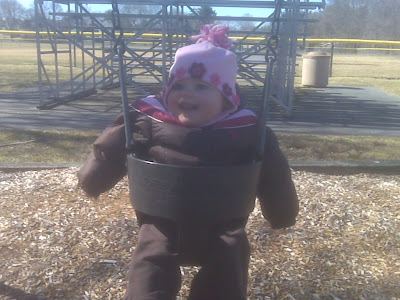 We learned today while trying to position her in it, that it's a tiny bit big for her. But in a couple months and another inch or so, she should be fine - so we'll definitely be hanging onto the loaner anyways! We had an appointment this morning with a guy from a medical supply company who showed us several great options for supine standers. Next step is an appointment with someone who can actually show us one of these specific models and make sure it would work for Meredith. Our PT is so optimistic about getting Meredith in the standing position saying it is beneficial for a variety of developmental reasons: improved sociability, muscle tone, bone density, joint developments, deepening hip sockets, and even helping with digestion. All good stuff! Meredith had a really sleepy day today, which was fine since she had a couple MAJORLY choppy sleeps the last 2 nights. Little munchkin took a short snooze from 9am-4pm. What?! When I picked her up from daycare tonight, they said she just woke up. Little Rip Van Winkle slept right through the nicest day of the year - it was 86° today! My Valentine's gift from Dad - baby Uggs from Australia! 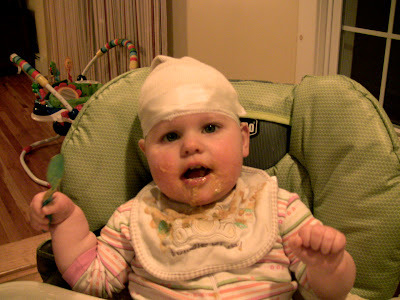 Tonight we heard back from our Neurologist with Meredith's EEG results. 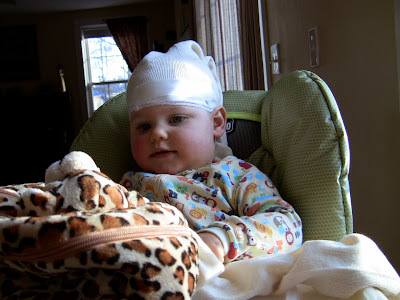 He emailed us "The EEG showed just some slowing, which is not unexpected in a child who has delays in her development. Slowing is indicative of some dysfunction in the brain, but is not associated with seizures or a tendency for seizures." So it's great that Meredith doesn't have a tendency toward seizures! This does confirm that there is some kind of dysfunction in the brain, but we still don't know what it is or why. 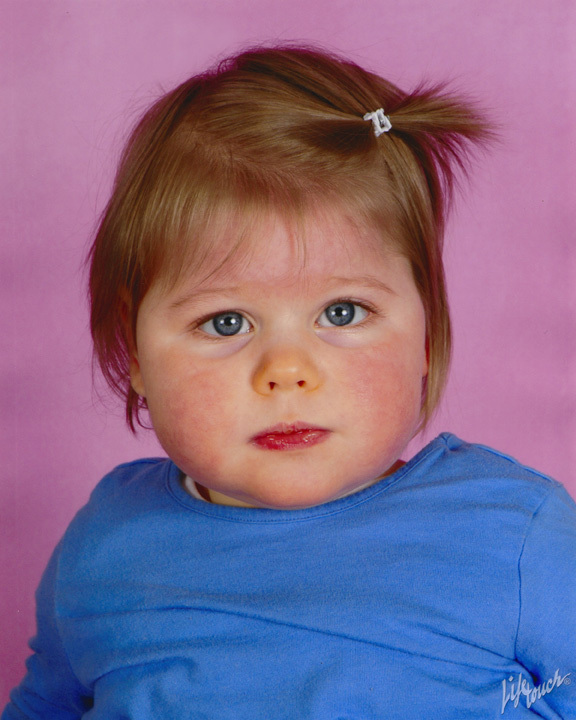 We pretty much knew there was an issue in her brain because of her developmental delays, we just hadn't seen it confirmed in any actual medical test yet. He said there was no further testing recommended at this time. The first time I stumbled across this, it was posted by someone from the Delayed Darlings online group where I am a member. It really hit home and I thought it was beautiful. So I'd like to share it with you! This morning Meredith and I headed into Waltham to see the Orthopedic Surgeon to talk about getting her a Supine Stander. It was a pretty quick appointment and in true Meredith fashion, she slept through the whole thing. He examined her body and hips and did a lot of bending and maneuvering limbs and said "well, if you are wondering if she has any orthopedic abnormalities - she has none!" More good news. He also checked her spine since low tone kids are at risk for scoliosis. Thanks to Meredith's hard work in tummy time boot camp, I am happy to report she has NO curvature of the spine - way to go Mer! He said to hold off on ankle braces for now but to get her a pair of sturdy shoes to wear in the stander - he actually recommended work boots. Anyone know where I can pick up some infant work boots?! Haha. He said she's doing a good job building back and trunk strength on her own and that a back brace would not benefit her since we want her muscles to continue to do the work to build her strength. He gave me a prescription for the stander and we made an appointment on March 5th to get her fitted for it. Insurance will cover 80% which is great. There is another little boy at daycare who also uses a stander so I got to see the one they have at KinderCare today. It is really cool, but GIANT. You can't even fit it in a car so his parents leave it there. I'm hoping we can get a bit more of a sleek model : ) I was told that his is quite old and that they are smaller now, hopefully that is the case! It’s Sunday, February 7th - Happy Superbowl Sunday! Go..... whatever teams are playing! While Greg is away in Sydney, Australia for work, Meredith and I have kept busy this weekend. We visited good friends Karrie and Colleen in Marshfield where Meredith LOVED chirping along with the exotic bird. Saturday, we went to a beautiful memorial to celebrate the life of my Mom's good friend Judy who will be missed by so many. Meredith was a social butterfly smiling and laughing all day. Last week was packed with appointments at various "ologists." We saw our Developmental Pediatrician who we LOVE. She is amazing. She put us at peace with not having a diagnosis and encouraged us to seek out other local parents who have special needs children. She felt that finding other parents who can relate is really important. Meredith had a 24 hour EEG on Monday into Tuesday. 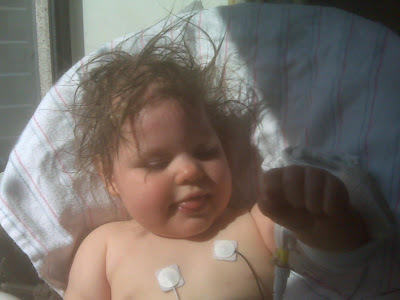 She has had 2 other EEG’s that both came back normal. Since we now have confirmation that she has had at least one seizure, the Neuro thought it was a good idea to do the 24 hour one. Sometimes kids can be having seizures at night and you wouldn’t even know it (a condition called ESES) and this directly impacts development. The good thing is it can be treated. We are not that hopeful that we will find any new developments with this test, but you never know. Meredith was a champ. She wasn’t happy about getting all the leads attached to her head, but once that was done, she did great. She and Dad picked out a special backpack that would house all her wires and a monitor. So she was very interested in her cheetah backpack that followed her around and we got to keep it after : ) We should hear results in a week or so. This week we go back to see the Orthopedic surgeon to talk about getting Meredith a supine stander, ankle braces (AFO’s)to wear while in the stander, and possibly some kind of back brace/support. Stay tuned! Meredith's PT is very optimistic that we can get her standing. So we are all excited to see that!